Yes, but in game I’ve seen it called the Railcannon. And in the official wiki it’s a rail rifle. I just wanted to confuse you a bit more. I call it a railgun, that’s the basic concept of the rifle. You can name the rifle something else, but it is still a “rail-gun”, using a rail to push out a projectile with magic. I love you right now for editing out that embarrassing title mistake…Yeesh. 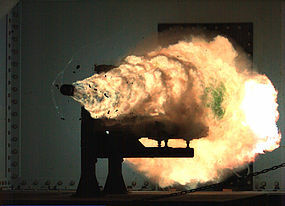 Railgun is a type of gun and Rail Cannon is a weapon name. Cant we just call it " that weapon everybody called op"? Rail Cannon is its name, Railgun is the name of the class of weapons I suppose. Easy solution here. Call it Rail.